When I went white water rafting a few weeks ago, my friend Kumi and I discovered a chestnut tree by the dock. We went nuts collecting them. Chestnuts come in prickly round shells with porcupine spines. My job was to stomp on them with my hiking boots to break them open and squeeze the chestnuts out while Kumi loaded up a grocery bag full of them. I was a little afraid that one would fall on my head from the sprawling tree, but it was worth the risk. If anything reminds me of Beijing, it’s sugar roasted chestnuts. They are ubiquitous there, sold in sugar stained paper bags at the Wang Fu Jing night market or in wheelbarrows on the edge of campus when I was at Qinghua. I miss how easily they cracked open. I got my mom’s friend’s recipe to try and replicate those chestnuts in an American style oven. Here we go. 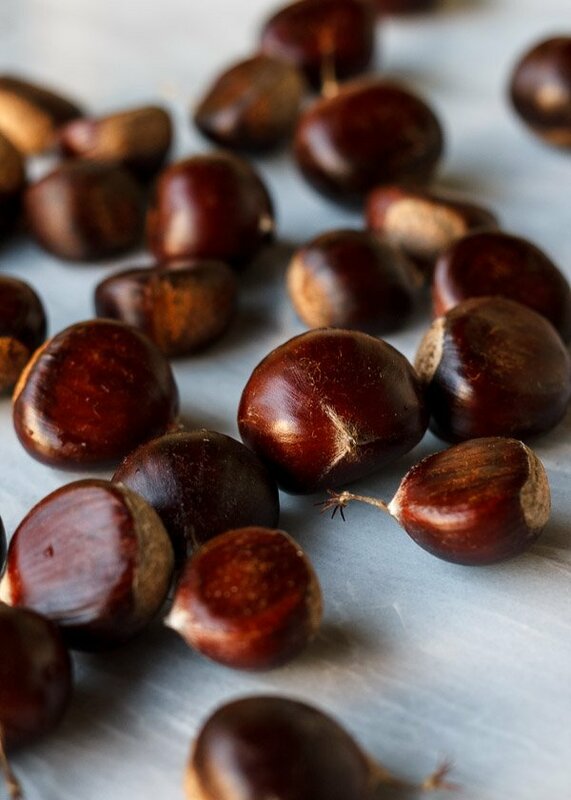 Chestnuts let out steam as they cook, so in order to prevent an explosion, you have to score them. I used a vegetable cleaver, a chef’s knife, a serrated bread knife, and finally, a pair of kitchen scissors as scoring tools. I liked the kitchen scissors best. I snipped the pointy tip of each chestnut, then ran the scissors in a line down from that first cut. Try to keep the cut shallow so you don’t break the chestnut meat inside. Some say a horizontal cut along the rounded side is better than a vertical cut, but I tried both, and found no noticeable difference when the chestnuts came out of the oven. The vertical scores are a lot easier to do with a pair of scissors though, so I think I’ll stick to that. 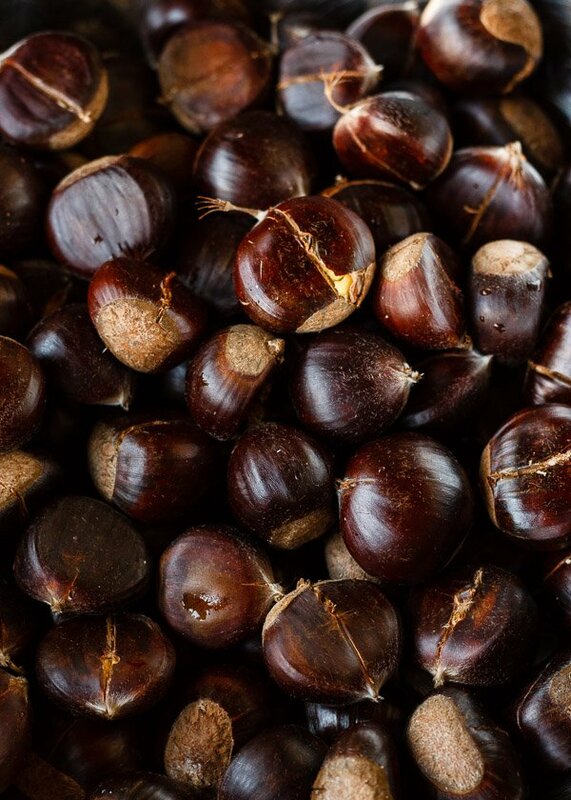 After scoring the chestnuts, you soak them in hot sugar water for at least an hour. They’ll start to expand during this time, the yellow meat breaking open the cracks. We finish them off in a hot oven, then crack them open and eat. I ate half of these standing over the stove, using the burners as cooling racks for my baking tray, and the other half I turned into soy braised chestnut deliciousness that peeps now want the recipe for, so that’ll be coming soon. 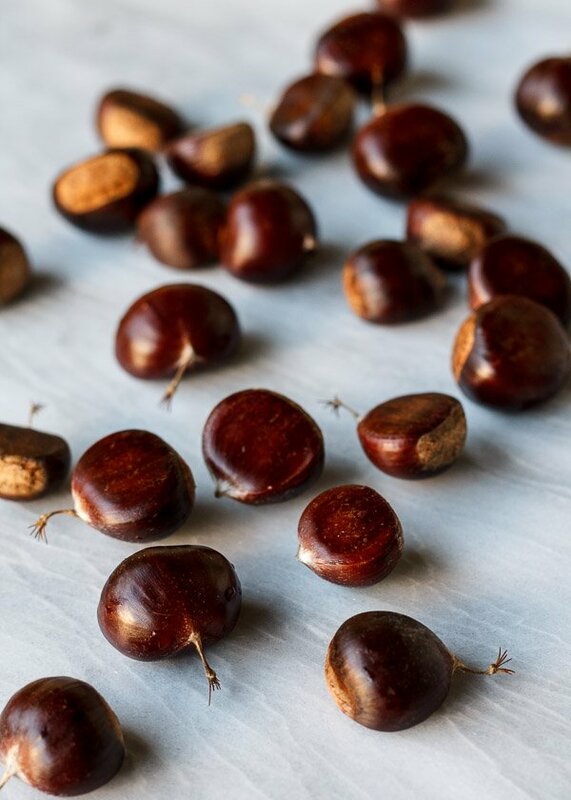 Score chestnuts with a knife or kitchen scissors. For me, a snip with the scissors at the pointy tip of the chestnut followed by a long vertical cut worked well. Put the chestnuts in a bowl, generously pour sugar on top, then pour boiling water into the bowl until the chestnuts are submerged. Stir to melt the sugar. You can taste the sugar-water mixture and add more sugar if it's not sweet enough. 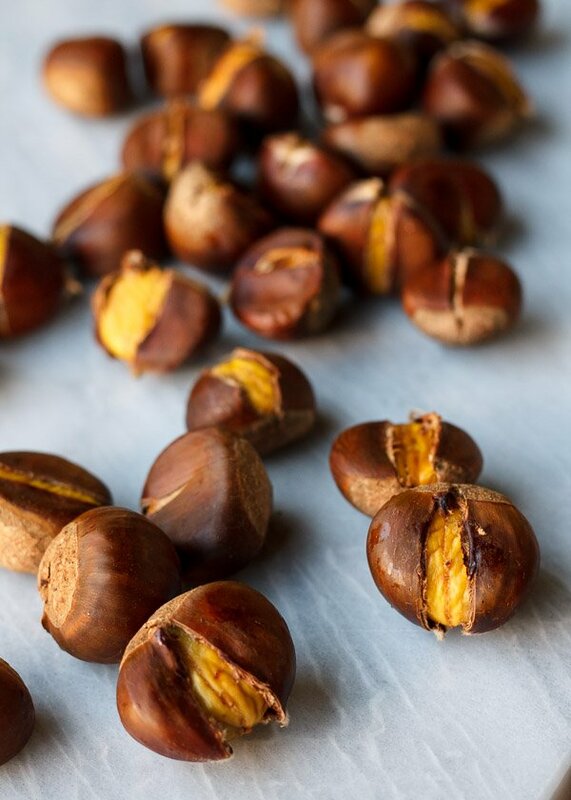 Soak the chestnuts for at least one hour. Roast chestnuts at 350°F for 35 minutes, rotating the baking tray halfway through if your oven tends to be hotter in back. Let cool for 5-10 minutes, then crack the shells open. It is much easier to shell all the chestnuts while they are still warm. 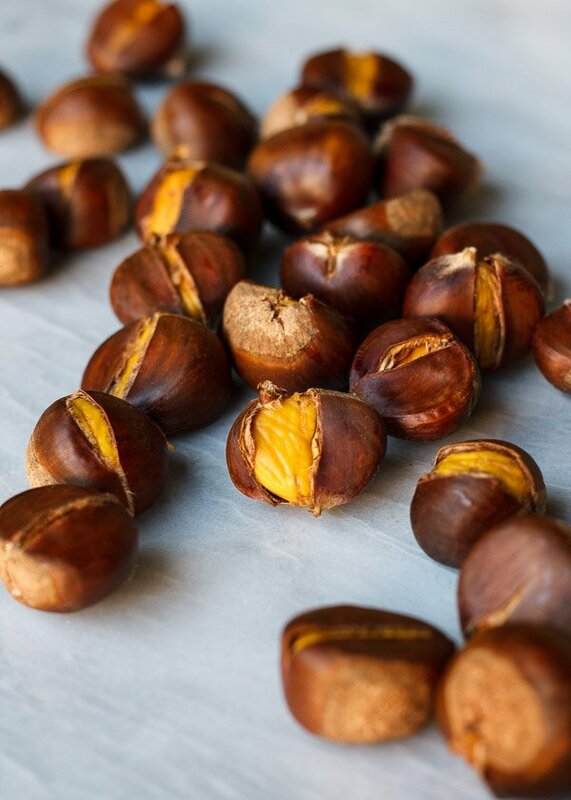 Store any uneaten chestnuts in the fridge. I am totally envious of you finding a chestnut tree! Visiting your blog often brings back so many memories of foods my parents used to cook for me. Every year my dad would love to roast chestnuts around this time of year. I bet these sugar-soaked ones are so GOOD! Aww that makes me so happy to bring back good memories!